Perhaps some people (like myself) were not concerned with who might or might not be offended by the cover, but were concerned with the impact the cover would have on the subconscious. One could reason logically all one wanted about why Barack Obama would make a good president, but in reality, thanks to the Clinton and McCain campaigns, many Americans subconsciously harbored the irrational fears highlighted in the image. Up until the very end of the campaign, an unbelievable number of Americans still thought he was Muslim. The visual image has a much stronger effect on the mind than words do- just ask the tobacco companies. I was disappointed by the cover not because I thought most Americans wouldn't see it as satirical, but because even if they did, I thought it would work on a subconscious level to keep those absurd fears lingering. I understand that the New Yorker was trying to confront those fears and point out how silly they were, but in my opinion, the image was counterproductive. As an Obama supporter, I only wanted to see positive images that made him seem presidential, powerful and not someone who fit into the category of "other". Anything else helped add fuel to the fires started by his opponents. Fair enough. Such things may well stick in someone's subconscious. It reminds me of the apocryphal story about Lyndon Johnson, in a political campaign, wanting to accuse an opponent of some sexual perversity. When his aides countered that he knew the man was innocent of any such perversity, Johnson allegedly said "I know; I just want to hear him deny it." Still, your worry is a worry about others; a little different from my second explanation (worry about subconscious effects, rather than worry about cultural cluelessness), but clearly related. 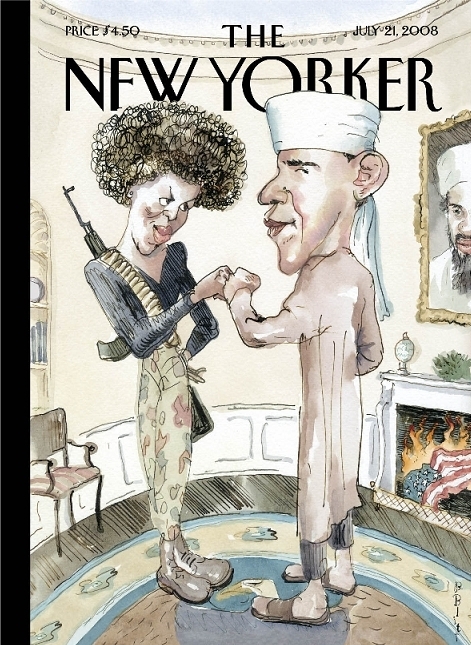 Of course, it was not the New Yorker's job to try to maximize political support for Obama. But this does raise an interesting question: Is it possible, in American politics today, to successfully satirize outlandish claims made by an opponent? Or will any attempt at doing so inevitably be counterproductive along the lines you suggest? I think it's also to important to keep in the mind that the New Yorker is in the business of selling issues. The simple fact that the image is certainly eye catching could motivate someone to pick up a copy. You could also make the argument that the "culturally clueless" would probably not be reaching for a copy of New Yorker when they could buy the latest issue of unsophisticated weekly(not real magazine, just a point I'm trying to illustrate). Another thing to consider is that even if this depiction is supposed to be satirical, the only insulting conclusions that could be speculated are those which pertain to race. President Obama referred to himself as "the ultimate optimist" in his first presidential address a couple of days ago. He certainly puts himself in the league of idealists, so what is the harm in visually comparing him to perhaps America's most well known one? I think you have a point about other people reacting insulted with the sentiments of others in mind. Though, I don't think they feel the need to be offended on behave of the truly insulted. It's more of a conforming tactic. Why take the risk of responding positively to this satire when you know that others, possibly your friends, won't react the same way. It's like Saturday Night Live...It's generally accepted as a humorous show and because of that, laughter is acceptable at their politically dicey comedy. The New Yorker, however, is not SNL. Personally, I would call this the furthest thing from negative publicity, given the fact that this would be non issue if it were any other president. Given that there is only one particular difference that sets President Obama apart from any other president; it serves as indication of the continuously taboo issue of race. Though, the fact that the cover was even printed should be a sign of advancement on that front. I think that ability to criticize or satirize politically outlandish things is indeed a cornerstone of our political process.Normatively, counterproductive conclusions about the image of a political figure really shouldn't be the concern of the publisher. I think Thomas Jefferson said it best, "I may not agree with what you say, but I will die defending your right to say it." So to the first commenter, you sound like have a crush on the President. No one is or should be exempt from criticism. We live in a society that values competition and sometimes those competing ideas reach the media. It tests boundaries and advances social acceptability which I think is good thing. Last Thing, What if Condoleezza Rice were on the cover dressed as Eleanor Roosevelt,the pioneer of the Deceleration of Human Rights?